← The joys of bread-making! Fu Lu Shou (simplified Chinese: 福禄寿; traditional Chinese: 福祿壽; pinyin: Fú Lù Shòu) is the concept of Good Fortune (Fu), Prosperity (Lu), and Longevity (Shou). This Taoistconcept is thought to date back to the Ming Dynasty, when the Fu Star, Lu Star and Shou Star were considered to be personified deities of these attributes respectively. The term is commonly used in Chinese culture to denote the three attributes of a good life. Statues of these three gods are found in nearly every Chinese home and many Chinese-owned shops on small altars with a glass of water, an orange or other auspicious offerings, especially during Chinese New Year. Traditionally, they are arranged right to left (so Fu is on the right of the viewer, Lu in the middle, and Shou on the far left). The Fu star (福) refers to the planet Jupiter. In traditional astrology, the planet Jupiter was believed to be auspicious. Alternately, according to Taoist legend, the Fu Star is associated with Yang Cheng 阳城, a governor of Daozhou 道州. Yang Cheng risked his life by writing a memorial to the emperor to save the people from suffering. After his death, the people built a temple to commemorate him, and over time he came to be considered the personification of good fortune. He is generally depicted in scholar’s dress, holding a scroll, on which is sometimes written the character “Fu”. He may also be seen holding a child, or surrounded by children. The Lu star (禄) is ζ Ursa Majoris, or, in traditional Chinese astronomy, the sixth star in the Wenchang cluster, and like the Fu star came to be personified. The Lu star is believed to be Zhang Xian who lived during the Later Shu dynasty. The word lu specifically refers to the salary of a government official. As such, the Lu star is the star of prosperity, rank, and influence. The Lu star was also worshipped separately from the other two as the deity dictating one’s success in the Imperial Examinations, and therefore success in the imperial bureaucracy. The Lu star is usually depicted in the dress of a mandarin. The Shou star (壽) is α Carinae (Canopus), the star of the South Pole in Chinese astronomy, and is believed to control the life spans of mortals. According to legend, he was carried in his mother’s womb for ten years before being born, and was already an old man when delivered. He is recognized by his high, domed forehead and the peach which he carries as a symbol of immortality. The God of Longevity is usually shown smiling and friendly, and he may sometimes be carrying a gourd filled with Elixir of Life. The Laughing Buddha’s image graces many temples, restaurants, and amulets, as he has become a deity of contentment and abundance. The image of Hotei is almost always seen carrying a cloth or linen sack (that which never empties) which is filled with many precious items, including rice plants (indicating wealth), candy for children, food, or the woes of the world. He is patron of the weak, poor and children. Laughing Buddha statues depict a stout, smiling or laughing bald man in robes with a largely exposed pot belly stomach, which symbolizes happiness, good luck, and plenitude. Some sculpture has small children at his feet. Another item that is usually seen with the Laughing Buddha figure is a begging bowl to represent his Buddhist nature. In some scenes the Laughing Buddha may be found sitting on a cart drawn by boys, or wielding a fan called an oogi(said to be a “wish giving” fan — in the distant past, this type of fan was used by the aristocracy to indicate to vassals that their requests would be granted). All of these images display Hotei as a wandering monk who goes around and takes the sadness from people of this world. Trees in general symbolize stability and growth, as well as a long life. Feng Shui gem trees have the additional benefits brought by the specific element in the tree, in this case Jade and Peaches. Jade or Yu in Chinese is a much sought after stone for its strong yet purifying and healing energy. It also symbolizes prosperity, nobility, happiness and good health. ThePeach has long been regarded as a traditional symbol for good health, longevity and immortality and it is always seen carried by ‘Sau’ of the famous three Star Deities Fu Lu Shou. It is also much revered as a symbol of love, romance and marriage. Therefore, it is no wonder that the Jade Peach Tree is very much sought after for its many positive and auspicious attributes. 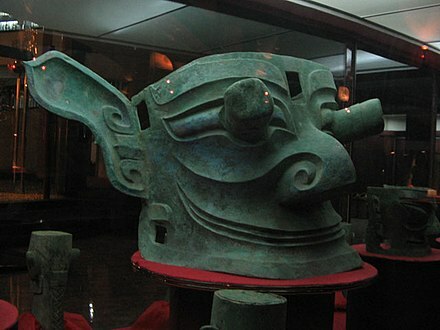 Large bronze head with protruding eyes, suggested by some to be of Cancong. Many archaeologists are identifying the Sanxingdui culture with the ancient kingdom of Shu, and linking the artefacts found at the site to the early legendary kings of Shu. References to a Shu kingdom that can be reliably dated to such an early period in Chinese historical records are scant (they were mentioned in Shiji and Shujing as an ally of the Zhou who defeated the Shang), but accounts of the legendary kings of Shu may be found in local annals. According to the Chronicles of Huayang compiled in the Jin Dynasty (265–420), the Shu kingdom was founded by Cancong (蠶叢). Cancong was described as having protruding eyes, a feature that is found in the figures of Sanxingdui. Other eye-shaped objects were also found which might suggest worship of the eyes. Other rulers mentioned in Chronicles of Huayang include Boguan (柏灌), Yufu (魚鳧), and Duyu (杜宇). Many of the objects are fish and bird-shaped, and these have been suggested to be totems of Boguan and Yufu (the name Yufu actually means fish cormorant), and the clan of Yufu has been suggested as the one most likely to be associated with Sanxingdui. More recent discovery at Jinsha is also assumed to be a relocation of the Shu Kingdom and continuation of the Sanxingdui Culture. Sanxingdui (Chinese: 三星堆; pinyin: Sānxīngduī; literally “three stars mound“) is the name of an archaeological site and its deduced culture in Sichuan, China, now believed to be the site of an ancient Chinese city. The previously unknown Bronze Age culture was re-discovered in 1987 when archaeologists excavated remarkableartifacts, that radiocarbon dating dated as being from the 12th-11th centuries BCE. The culture that produced these artifacts is now known as the Sanxingdui Culture, and archeologists are identifying it with the ancient kingdom of Shu. The artifacts are displayed in the Sanxingdui Museum located near the city of Guanghan.